The Penang property sector is expected to see some challenges going forward. Real Estate and Housing Developers’ Association (Rehda, Penang) chairman Datuk Jerry Chan expects another 30% decline in property transactions in 2015 from the 30% drop recorded in 2014. Another indicator of the bumpy road ahead is the high rejection rate for housing loans, which according to Rehda Penang deputy chief Datuk Toh Chin Leong is 50% for some projects. “You don’t see this three years ago, but it has been happening for the last 18 months,” Toh says. 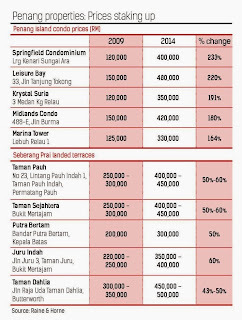 Notwithstanding the challenges predicted by the association, there are at least 10 residential addresses in Penang where prices have appreciated substantially since 2009, unaffected by the economic uncertainties. Raine & Horne director Michael Geh says these addresses are not in the premier category, but are sought after because of their pricing, location and facilities. “They have benefited from the new infrastructure, malls and other amenities that have mushroomed around them. Owners are not speculators and would not give them up unless the offer is good. This is another reason why these properties have appreciated rapidly,” Geh says. On the island, the five addresses are Springfield Condominium in Sungai Ara, Krystal Suria in Bukit Jambul, Leisure Bay in Tanjung Tokong, Marina Tower in Relau. In the north-east district, prices of Leisure Bayand Midlands Condo have appreciated by about 200%. The second bridge project, announced in 2006, the construction of the Subterranean Penang International Convention and Exhibition Centre in Bayan Baru and the Penang Waterfront Convention Centre next to the Penang Bridge, have helped to boost prices. Both convention centres will be ready this year and 2017 respectively. On the mainland in central Seberang Prai, the popular addresses are Taman Pauh in Permatang Pauh, Taman Sejahtera in Alma, Putra Bertam in Bertam, and Juru Indah in Juru. In North Seberang Prai, it is Taman Dahlia in Jalan Raja Uda. Landed terraces in Taman Pauh, Taman Sejahtera, Putra Bertam and Juru Indah have risen between 43% and 60% since 2009. The second bridge project linking Batu Kawan in South Seberang Prai and Batu Maung in the southern part of the island has driven up property prices located at both ends of the bridge. Using 2006 as a benchmark, Geh says the price of vacant land has increased to between RM250 per sq ft (psf) and RM300 psf in Batu Maung from RM50 to RM60 psf. “Pricing depends on whether the land has been zoned for agriculture, commercial or residential use,” he says. 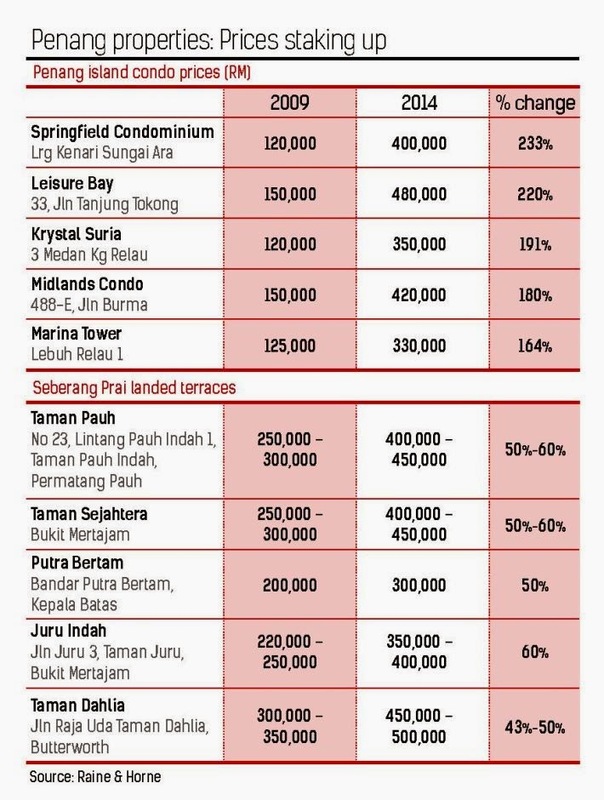 Prices for new two to three-storey terraces south of the island start from RM1.2mil, compared with about RM450,000 prior to 2006. “New condominiums in similar locations are now priced at between RM700,000 and RM800,000, compared with between RM250,000 and RM300,000 prior to 2006, when the bridge was first announced,” he says. Properties located in the prime locations of central Seberang Prai and south Seberang Prai have also increased significantly. Henry Butcher Seberang Prai’s associate director Fook Tone Huat says vacant land in the area, especially those in south Seberang Prai where the second bridge is located, are between RM42 and RM60 psf, a huge jump from 2006’s RM8-RM9 psf. Land prices in central and north Seberang Prai were then between RM20 and RM40 psf, compared with today’s range of between RM50 and RM120 psf. The increase in land prices has translated into higher property prices. “New landed properties such as double-storey terraced units in south Seberang Prai are now priced between RM360,000 and RM450,000 compared with between RM150,000 and RM200,000 prior to 2006,” Fook says. Double-storey terraces in prime locations in central and northern Seberang Prai have doubled, from RM200,000-RM270,000 to RM400,000-RM630,000. “We are also seeing a number of life-style condominium projects being planned in Bukit Mertajam this year with prices between RM300 and RM350 psf,” Fook says. As for the secondary or sub-sales market, double-storey terraces, depending on location, are priced between RM300,000 and RM600,000. Aspen Group Holdings Sdn Bhd and PE Land Sdn Bhd’s plans to develop an Ikea store and the RM1bil Penang Designer Village, which also includes a RM200mil premium outlet respectively, will drive up prices further in Seberang Prai, especially those located near the second bridge. Moving forward, Geh says south-west district properties will benefit from the state government’s plans to transform the Bayan Baru township into an international business process outsourcing (BPO) area. Two multi-storey blocks will replace the current Penang Development Corp headquarters. The 29 and 25-storey blocks will house retail and recreational facilities. “In the north-east district, the opening of the Gurney Plaza and Gurney Paragon shopping malls respectively in 2001 and 2013 and the increase in food and beverage outlets in the Pulau Tikus and Tanjung Tokong neighbourhoods have boosted prices. Eastern & Oriental Bhd’s plan to undertake RM25bil worth of residential and commercial projects for the second phase of Seri Tanjung Pinang over the next 20 years is another boon for the island. This involves reclaiming 307ha in Tanjung Tokong.